I love my QH's and Paints so I am in no way trying to throw them under the bus, but I want to talk about why some end up with Navicular as such a young age sometimes. It makes me wonder if it is hereditary at all. The most money I ever spent on a horse is this guy a 1988 APHA gelding CC Dandy Reed http://www.allbreedpedigree.com/cc+dandy+reed" onclick="window.open(this.href);return false; . He was a really nice looking horse with good foundation bloodlines. Now he was not real smooth and he would stumble somtimes and my farrier pointed out right after I got him in 1992 that he has short pasterns and that he felt that he would develop navicular, and he called it, Dandy had Navicular by the time he was 6. I managed it with flex free and wedge pads but still that was pretty young to devlelop that problem I thought. Another gelding that I bred and sold as a 3 year old, his girl called me a few months ago and was crying on my shoulder because she had just found out he had Navicular, he is just 8. Now he did get really big, I always got him trimmed regular when he was with me and the girl bought him from the man I sold him to so I don't know what his hoof care was like then, but still it just seems aweful young to develop Navicular. I had his mom until she was 19 and she did kinda have underrun heals but was always very sound, she just developed arthritis in one of her knees due to knee injury but that wasn't until she was 18. 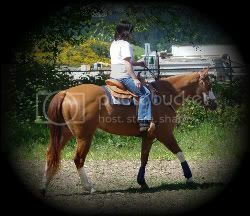 This is the boy that I bred that has Navicular now. http://www.allbreedpedigree.com/justanamericancowboy" onclick="window.open(this.href);return false; I also know a woman that had a 4 year old QH she had to put down because it had Navicular so bad even at just 4. Does anyone on here think that it may be hereditary in some lines, I know TB's get it too, and they say its because the horses have been bred so big with small feet but there are some QH lines that don't seem to have this problem. I know to that there are alot of factors like conformation and hoof care but when they get it so young it just raises the question, is there somthing we are overlooking? 100% care in my opinion (except like in the case I heard Dr. Valk describe where the horse was born without a navicular bone. :shock: ). But it's SO many different things contributing, not to mention "navicular" is a syndrom, not a well defined desease with a certain cause. It's more like "extreme heel pain that may or may not have these particular physical changes" :? Failing to trim them regularly as foals and young horses and shoeing for long periods without breaks but especially before 5 years old keeps the hoof from developing fully. Long underrun hooves, too upright hooves, basically extremes in general are bad. Lack of free walking movement (stalling) predisposes. All sorts of stuff, often in combination. For instance it's very common in halter horses, they are shod young and stalled (both of which keeps the hooves from growing, hence the tiny foot look. If you treat them like a normal horse from birth they often can grow normal sized hooves), overfed. Seems to be really common in show horses of any sort, which are also stalled and shod so I'm pretty sure there something there. Genetic hoof size is related to bone thickness, if the hoof looks far too small for the horse structure it's likely that something hampered it's growth and it's contracted. Horses with naturally light bones and small hooves can be plenty sound even if they have some muscle on them. A horse with contracted, immature feet however will have problems. At 3 years old their legs may be done growing in length but they can still build up bone mass, the hooves are included in that. That growth is supposed to level off about 5 years old (incedently the same time the spine closes). I don't think that short pastern have much to do with it, however if the hoof is not trimmed well or often the angle of the hoof can get off, which is probably worse if the pastern is steep. A lot of people out where I was at least don't start trimming till the horse goes into training, or just trim young horses like twice a year when that's the most important time for 4-6 week balancing at the very least even if there isn't a lot of growth. Shoeing unnaturally lengthens the hoof about the same as failing to trim regularly does. More wall must be left in order to nail the shoe on, which itself adds length, then you wait 6-8 weeks to trim and reset and add that amount (about half an inch) of growth to it- you get the picture. The concept of the wedge pads is to shorten breakover but that's easier done by just ditching the shoe, trimming the toe well and turning the horse out. I would definitly be looking carefully at the trimming and care practices because that is very young to be having those problems on that many horses. I agree with what Morgan wrote about trimming and allow the hoof to grow. I also want to add a bit more. The term navicular is really vague. Yes, the lameness associated with navicular syndrome it can be caused by arthritic changes to the navicular bone, but there are several other areas of the foot that can be damaged that will have the same lamenesses. With the advent of MRI, we are now able to actually more accurately diagnose the source of lameness and there are many cases where it is the soft tissue structures of the foot. These include the flexor tendons, various ligaments and all their associated synovial structures (tendon sheaths/bursas/etc) plus the other bones and joints of the foot. The poor navicular bone has been quite maligned with being blamed for a multitude of injuries that combine to be navicular syndrome. Is the MRI becoming widely available for hooves now? Lace blew an abscess out of her heel bulb during a very soggy time. She had also been showing heel pain prior to the abscess and she was still a bit underrun at the time. She also showed alot of heel tenderness a month or more after the burst. I have other photos if it would help you in any way. I just thought I'd post this as this was pretty much the same scenario you just mentioned. MRI of the legs and head/neck are generally available anywhere there is a veterinary MRI. There is a major difference in treatment of bone versus soft tissue so it is actually really important to identify the cause of the lameness. With bony changes like arthritis, you want to keep the horse active and use anti-inflammatories to reduce pain and shoeing/trimming changes to reduce stress on the bone. If it is soft tissue, you need to treat the injury (stem cells, surgery, IRAP, shockwave, etc) and rest/restricted activity to allow the soft tissue to heal. Personaly I believe that it is hereditary in that some horses inherit the kind of conformation that cannot cope with the husbandry they recieve while others have the conformation to cope despite long term shoeing, poor breakover and lack of turnout ect. Also as has been said already Navicular is the swiss cheese affect of the Navicular bone, Navicular syndrome means caudal foot pain. Could be almost anything. Thanks for all the feedback, I understand that all the factors that were mentioned are important. Liliths point does make sense to me also, I think what she said was the point I was trying to raise. Both the horses I have now have very good hoof conformation, but with Annie she may fill out huge if she is going to take after her parents so I may have to watch her weight. She is a good weight now but she is only 4, QH's don't really fill out until the are 5. I have never really owned any other breeds, is Navicular a problem in other breeds as well? The one horse I owned that truley had picture book feet naturally was a blue roan grade mare, but she was QH type, ugly head but great feet. I was told when I bought her she was mustang but she didn't have the brand. Do mustangs get Navicular???? :-? Actually, this is no longer the correct definition. Studies have shown that the size of the vascular channels in the navicular bone are not as correlated to lameness as previously thought. It is bony changes along the cortico-medullary junction and osteophyte/enthesiophyte formation along the bone edges that are the actual determinants of navicular bone disease. The use of MRI has changed navicular syndrome. It used to be "Lame horse. Let's x-ray. Yep, big holes in the navicular bone, must be navicular." Now it's "Lame horse. Let's x-ray. Only changes seen are large vascular channels. Let's MRI. Holy crumb, look at the giant tear in the deep digital flexor tendon." Is that why the vet in the video says it is not longer why they even call it navicular sydrome but rather caudal heel pain? I guess its just a area with so many little working parts and so many different things can go wrong and It has to support so much weight as well. That basically sums it up. The equine fetlock and hoof is an amazing machine. The amount of force placed on such a relatively tiny structure is mind-boggling. If any one of the parts is malfunctioning, breakdown can happen so fast. I got to see if I can find it again, but within the past week or so, a FB friend shared a video of the equine hoof/lower leg in various modes of operation--running, trotting, jumping. It was pretty awesome. :-SS I guess a good farrier is key then, I just got a new one ymwhisle. All my horses have and always have had shelter with open access to pasture. The first horse I posted "Dandy" I had a good farrier when I was living down in CA and he kept him really comfortable and I told the lady I sold him to he had Navicular and that to use the same farrier because he was doing a good job. After I left she switched farriers and he went lame again. ~X( She found out I was upset and she wrote me a letter saying she would do everything she could for him even if she needed to do a nerve block or whatever, so I just let it go after that. Cool can you post that?? I have to try and find it...all I remember is that it was a few days ago, maybe a week. I had a quick look last night (since posting it here was my original intent), then realised that FB probably took away the thumbnail, so I'll need to take a closer look. Those are interesting, I looked at a few more, most were in German but I found a couple that had english subtitles. Okay, found the link I originally posted on facebook, and it's not a YouTube link. Followed it back to what should be the original source, hopefully the page is public. Hey Monster... have you gotten to dissect many legs and really look at what's going inside with some of these injuries/diseases? I have dissected several legs, though not many specifically for navicular. I have examined many MRIs used for navicular studies, though. One of the surgeons at my university does a lot of research into navicular syndrome and he is the one that strongly advocates for MRI to determine the cause of lameness. I'm going to be witnessing the complete dissection of a leg with severe ringbone (severe, chronic lameness even at a walk) and the horse's other front which is believed to be normal. We're hoping to do photos (I'm certain that will happen) and video. We're doing it at a major farrier school that we have alot of respect for and they plan to have a full class present to witness. I'm very anxious (though scared) to see this and what exactly was going on in that leg to make him SO lame. We never did Xrays or an MRI as we were certain that regardless of the diagnosis he could not be helped. If it's of any interest to you once it's done I'll send you whatever media we have from it. It's not navicular (we don't THINK anyway) but it should still be interesting and somewhat related.